Brazil is hanging up its football boots after what has been seen as a hugely successful World Cup - perhaps not for the hosts but for the thousands of fans who came to watch the games here. 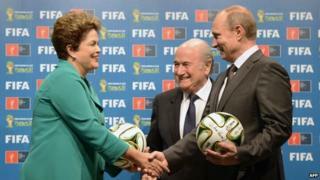 Brazil's hospitality will now move from the pitch to politics, as it prepares to welcome the leaders of Brazil, Russia, India, China and South Africa to the sixth Brics summit in the north-eastern city of Fortaleza. It is an annual diplomatic meeting that brings together these regional leaders and economic powerhouses. And every time it happens, there are questions about whether the Brics grouping is anything more than a catchy acronym. "The Brics isn't a trade bloc, it's a group of letters making up a word and created by an economist," says Jose Augusto de Castro, the president of the Brazilian Foreign Trade Association. "If Brazil exports to China, India or Russia, or vice versa, it doesn't get any benefit - it's just an informal grouping." And far away from Fortaleza, in Brazil's southern-most state of Rio Grande do Sul, on the border with Argentina, this observation seems fitting. Micheline Grings Twigger proudly shows me around Piccadilly, her family-owned shoe factory. The four production lines on the factory floor are buzzing with people cutting material, gluing heels and putting into boxes just some of the nine million pairs of shoes that the company produces every year. Micheline says Piccadilly has come a long way since her grandfather started the company nearly 60 years ago. With 4,000 employees, it exports to about 90 countries. But look at the figures more closely and they reveal that of the shoes the company produces, only 10% are exported outside of South America. Media captionKaty Watson travels to Brazil's southern-most state of Rio Grande do Sul to find out what ties the Brics nations together. Brazil is one of the world's most closed economies. According to the World Bank, exports account for just 13% of GDP - its Brics peers export double that. And while China is Brazil's biggest trading partner, it is a relationship that is based on China's appetite for Brazil's commodities. That is where the important relationship ends - for most other industries, China is seen as a threat. "We are competing all the time because no-one can produce shoes with the prices of China," says Micheline. "At the same time, it's a big opportunity considering the size of the market, it would be crazy not to look at China as a big market for us." While trade may not be the Brics' strength, the one thing that does unite these countries is their dissatisfaction with the current global order. They feel that with their population and economic might, they deserve a bigger political role in the world - one that traditional Western institutions do not recognise. "The Brics is more than just about economic relations - it's also a way to diversify and hedge against western influence," says Harold Trinkunas, a Latin America expert at the Brookings Institution in Washington DC. "Brazil sees itself as part of the countries that are rising and critical of the present international system which is structured in a way that doesn't reflect the actual distribution of power and influence in the world." Brazil's diplomatic efforts in the past decade or so underline this feeling - under former President Lula da Silva, Brazil promoted South-South co-operation - the exchange of knowledge and technology and the building of relationships between developing countries in the global south. But while politically it was important because it tried to move away from traditional markets like the US and Europe, experts are not convinced of its economic benefits. "South-south relations were a catchy phrase but, aside from the huge surge in trade with China, which would have occurred without the south-south rhetoric, it didn't do much for Brazil's economy," says Peter Hakim, President Emeritus of the Inter-American Dialogue. "The US, EU, and Latin America have remained Brazil's key trade partners aside from China." So, while the grievances about world order have been various, the approach to deal with them has been weak. But this summit could be different - it is expected that leaders will announce plans for a Brics development bank to rival the World Bank, a step that is seen as significant. "So far they've only been an informal set-up and now for the first time they will create an actual institution," says Oliver Stuenkel, Professor of International Relations at the Getulio Vargas Foundation in Sao Paulo. "The big question is whether the institution can really challenge the World Bank and develop a sense of competition or whether it will be a mere symbol and I think it depends a bit on how these countries get along." Its strength also depends on finances - how much the countries can contribute to the development bank. Brics economies are slowing. Brazil grew just 0.2% in the first three months of this year. And with elections coming up in October, Brazil's focus has turned back to domestic issues. "I don't think that if Brazil was now to be thinking about these plans from the drawing board, it would really be thinking about a Brics development bank," says James Lockhart-Smith, a Latin America risk analyst at Maplecroft in New York. "It would be more focused on restarting growth in the country." But at a time of slow growth, Brazil probably needs these economies on side more than ever. Add to that, trade with economically troubled Argentina - traditionally one of its biggest trading partners - has become more difficult in recent years. So establishing a development bank that will unite this grouping and give the Brics some clout could pay off both politically and economically. Africa debate: Is Nigeria ready to lead the continent? The Mint countries: Next economic giants?